Well, I made a big mistake this morning… See, over the past few years we’ve had some major work done to the exterior of our 100+ year old house. New roof, new siding, new doors, some repaired brickwork, a new porch, basically — short of an addition — we’ve done it all. Though it’s a two car garage and that would indicate that it was built in the 70’s or 80’s, I’d venture to say that it was actually built in the 1940’s based on the knob and tube wiring throughout which I disconnected in the summer of 2007. It was probably a huge status symbol back in the day. It’s a junky looking thing. An eyesore. A 400 square foot wood framed rectangle built on a slab with cheap, dented, and rusting metal doors, a boarded up window (where the roofers tossed a brick on to my BMW), tons of peeling paint, and crumbling asphalt shingles. As you may have guessed, it’s not nice to look at. To its credit, it does have really nice copper gutters which, unfortunately, the previous owner painted. Really, it doesn’t have much going for it. The elephant in the, um, yard. It’s dirty and old. One bay has the BMW in it. The other bay has a couple of lawn mowers, a snowblower, my airplane, the garbage can, and an assortment of other lawn tools. There is no possible way we could fit another car in there. So, obviously, I’d like a larger garage — something that, at the very least, could fit all three of our vehicles, and if possible, all of the lawn equipment as well. We’ve got enough property to expand, and if need be, we could always add one of those pre-made sheds they bring over on a wide-load truck for the lawn equipment. I don’t really like those, but it would certainly free up some space. This could totally work. I mean, honestly, it would be nicer than my house, but at the same time, it wouldn’t overpower the house either. I hate that, you know, when you see a raised ranch style home being towered over by its garage. This is unquestionably a large structure, but my house (which isn’t a raised ranch) would still be an entire story taller — and it’s in the same style as my house with the gabled roofline. Basically, it works. I can picture it already. 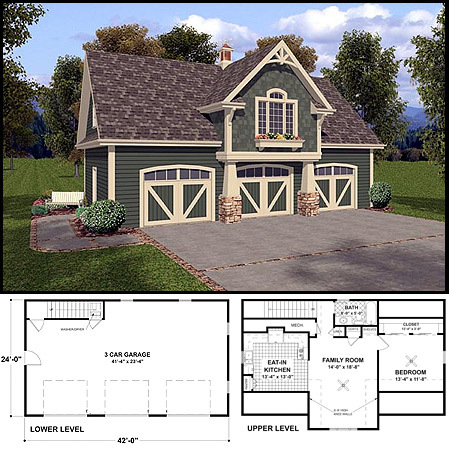 Zoning, however could be a problem… I’ve heard horror stories about people trying to build two story garages in town. It’s one of those things were it can only be done if you know a guy, who knows a guy, who knows yet another guy. Price? Well, obviously that would be a problem as well. I’ve no idea how much something like this would cost to build, but when I put my mind to something, I usually get it done. It kind of reminds me of how in high school I joined Columbia House to get 12 CD’s for a penny without even owning a CD player. Just the fact that I had a CD collection made me feel the need to save up and buy a CD player — which I eventually did. Relating to the present, I’ve got three cars… See where I’m going with this? It’s okay to dream though, right? Paid the Mortgage... Not Stimulated.